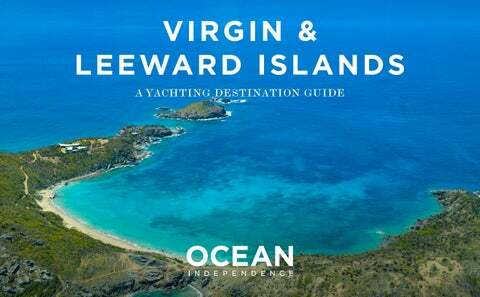 YACHTING IN THE VIRGIN & LEEWARD ISLANDS A speckled mosaic in the Lesser Antilles, the picture-perfect Virgin Islands are just 100nm from the delicate arc-shaped chain of the Leeward Islands. Given the proximity, these island groups can be perfectly combined for extended cruising in charter itineraries longer than one week. Offering exceptional cruising grounds, tucked away from the â&#x20AC;&#x2DC;Leeâ&#x20AC;&#x2122; trade winds, these isles are blessed with talc-white beaches encircled by sparkling blue water. Each has a unique personality: bustling St Maarten and St Thomas bring a distinctly cosmopolitan vibe, St Barts is a popular celebrity haunt, while Virgin Gorda is renowned for its yachting scene. Experience the mesmerising underwater caverns in Anguilla, or dine beachside under the shady coconut palms in laid-back Saba. ade up of around 50 small isles, the US Virgin Islands are an intoxicating blend of beachfront chic and natural beauty. Tranquil St Johnâ&#x20AC;&#x2122;s, the smallest isle, combines countless hiking trails, ancient sites and a powdery shoreline within a breath-taking national park that covers two thirds of the landscape and offers excellent eco-tours. Shop for unique island crafts such as ceramics, jewellery batik or silk screened fabric and visit the Elaine Ion Sprauve Library and Museum, situated in a restored mid-1700s manor house. In contrast, cosmopolitan St Thomas is a busy port with luxury resorts, sophisticated lifestyle and a fascinating piracy history. Insider Tip: Visit the reef at uninhabited Buck Island National Wildlife Refuge to snorkel up close with the resident Green Sea Turtles. pristine yachting destination which is ideal for island-hopping, the volcanic archipelago of the British Virgin Islands conveys barefoot luxury. Lively Tortola is laden with white sand beaches, while the capital, Road Town, is an energetic hub. Surf at Cane Garden Bay, anchor in Brandywine Bay or visit the game-fishing mecca in the North & South Drops. Naturally stunning, relaxed Virgin Gorda emanates an eclectic heritage - don’t miss the ethereal Baths’ massive granite boulders, grottos and exotic pools. Food and fun abound on verdant Jost Van Dyke, where Foxy’s Bar at Great Harbour is famed for its yacht-filled New Year’s Eve parties. On northernmost Anegada, over 300 wrecks will delight divers, whilst the flocks of local flamingos create an amazing spectacle and the pink sand beaches offer total seclusion. Insider Tip: Uninhabited Norman Island is famous for Blackbeard’s legend – explore the caves and dine at ‘pirate ship’ restaurant Willy T moored in The Bight. nguilla is a high-end, low-key island, bursting with natural beauty and a Calypso soul. Perfect white sand stretches for miles, while Shoal Bay provides a snorkelling paradise. Swim with dolphins at Blowing Point, then sip cocktails at the funky Dune Preserve beach bar. Discover a heady mix of French and Dutch culture delivering an exciting balance of fusion cuisine, vibrant nightlife and cool beach club scene on “the friendly island” of St Maarten. In Philipsburg, find duty free shopping, try your luck in the glittering Coliseum Princess Casino or take a refreshing dip in Orient Bay. Insider Tip: At Pic du Paradis, adventure-seekers can ride the explorer lift to the peak, then soar back down over the forest on the world’s steepest zipline! he two stunning islands of St Kitts and Nevis are separated by The Narrows, a shallow two-mile channel, and are perfectly positioned for island-hopping. Volcanic in origin, central peaks are blanketed in rainforest and dominate the landscape. Take a hike through the Valley of Giants or plunge on a zipline over the tree canopy. These isles appeal to the adventurous and represent the vibrant fun of Caribbean life. St Kitts comes alive in a riot of colourful culture, especially during carnival time from November to early January. Insider Tip: With its long stretch of fine sand and breath-taking views of nearby Nevis, secluded Cockleshell Bay is a great spot for families. ith stunning cruising grounds surrounded by intense natural beauty, distinctly French St Barts radiates an exclusive vibe as a jet set beach retreat. The mix of charming rural villages, glistening beaches and chic capital Gustavia simply add to the draw. Nearby, the diminutive rocky isle of Saba, tiny in stature yet with great allure, entices diving and snorkelling devotees to itâ&#x20AC;&#x2122;s colourful marine park. Sint Eustatius, characterized by its dormant, symmetrical volcano, The Quill, holds a pocket-sized rainforest in its crater, whilst underwater, corals and reef fish create a vibrant colour palette. Insider Tip: Excellent surfing is found at Lorient in St Barts, with challenging breaks for experienced wave riders or calmer spots for first timers. sanctuary for those seeking a slower pace of life, the quintessential swaying palms and icingsugar beaches of Antigua and Barbuda fit the bill. Glamorous Antigua is a dream for surfers, divers and hopeless romantics. Historic sites, humid rainforests, billowing blowholes and buzzing markets ensure appeal endures. Smaller, but no less beautiful, Barbuda is fringed by powdery beaches, spectacular coral reefs and is renowned as a great location for kitesurfing. Insider Tip: Fascinating Amerindian rock carvings can be found at Two Foot Bay in Barbuda. tunning views greet yachts in Montserrat - sheer cliffs rise from the sea, sprinkled with hidden bays coveting intimate beaches, perfect for watersports. Take an exhilarating helicopter flight for aerial views of the momentous Soufrière Hills Volcano and unique island landscape. With rugged Basse-Terre to the west and the rolling hills of Grande-Terre to the east separated by a narrow strait, the French hideaway of Guadeloupe offers plenty of options for those that like to be active. Stretch your legs by taking one of the hiking trails in the National Park, or explore underwater with great diving opportunities wherever you drop anchor. Volcanic Dominica is blanketed by a rainforest that begs exploration - visit Champagne Reef with it’s sulphurous hot springs, enjoy superb diving, or tackle the Caribbean’s first long-distance hiking trail. Insider Tip: Rendezvous Beach in Montserrat is the perfect place to anchor off and let the children enjoy a paddle in it’s shallow waters.